We help leaders determine what matters most for success and get their team actually doing it! Be more focused, committed and productive? Work together and communicate as a team? Develop the potential of themselves and their people? 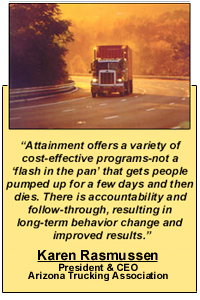 Attainment, Inc. is committed to helping clients develop the culture necessary to achieve their goals. We work with leaders to implement Strategic Development to improve individual and team performance. Using Awareness, Planning and Results Management, we help leaders identify what matters most for their success. Then, using our proven Behavior Change Process, clients Develop their People and Processes in the areas of Supervision, Leadership, Team Building, Communication, Productivity, Sales and Coaching. Listen to a client going through our process with measurable BIG $$ return on investment. Click here for information on our Leadership Productivity & Goals Achievement Workshops! Contact us to tell us about your goals and learn about the Executive Showcase where you can experience our Behavior Change Process risk-free. Attainment, Inc. | (602) 615-4163 | (480) 991-8654 fax | Contact Us | Copyright © Attainment, Inc.